The third bell rings every hour. If all the bells ring together at noon, at what time will they next all ring together? 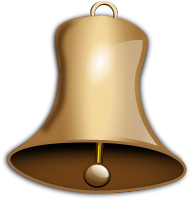 Here is a simulation of the ringing bells using seconds rather than minutes. We managed to work it out. We really enjoyed the puzzle as it allowed us to work on our time skills and gave us good practise at using calculators. This starter has scored a mean of 3.2 out of 5 based on 236 votes. The lowest common multiple of 6,7 and 60 is 420. 420 minutes is seven hours. Here is the URL which will take them to a related fun student activity. Here is the URL which will take them to a more traditional exercise on finding the lowest common multiple and highest common factor.